Die Cutting Tooling can either be treated as an asset or as a liability inside your business. When treated properly die cutting tools can increase your company’s revenue streams. However if tooling spend is regarded as a necessary evil it will only constrain your internal business operations. 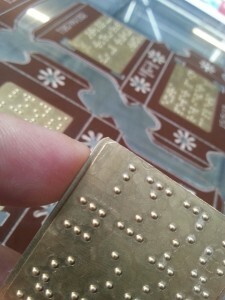 Outlined below are some of the basic facts of the die cutting process. A common misconception is all die-cutting tools are made to the same standard, this is not the case. Nor are they CRAFTED to the same standard and this is very important. The quality of die cutting tooling has a direct impact on the performance of your die-cutting and gluing processes, your product quality and even performance on packing lines at your customers’ site. The quality of printing plates has a direct impact on print quality but not production speed. I.e. with inferior plates you can still run at high speed, with inferior tooling you cannot. The manufacture of die-cutting tooling is fundamentally about ‘time and materials’. If we want to make them cheaper, we have to make them faster or use cheaper materials. And making them more quickly often means taking shortcuts. Cutting corners directly impacts on the standard of the end product that is produced. This then creates additional issues in carton or box production. Most carton companies do not measure the cost of downtime from inferior tooling in a scientific way, but many have identified this casually and indicate significant improvements when higher quality tooling is used. Companies often take different strategies in relation to tooling costs and how those costs are recovered. In some cases where origination costs can be a negotiating point, the carton sales rep will try to discount this cost as much as possible without fully understanding what is involved. Tooling costs are seen as liabilities and as barriers to new business. In order to secure an order for hundreds of thousands of cartons, a carton sales rep will frequently offer incentives around tooling. For the sales rep there is on-going repeat business, while for the die supplier the one off sale against that order is usually less than €1000 and he is being asked to heavily discount to secure business for his customer. Frequently origination costs are discounted and the die supplier is expected to ‘share the pain’. Others only pass on the costs for the die and not the strippers, counters, blankers or other tooling elements. While these other elements have a direct purchase cost, this cost needs to be weighed against the alternative. For example if you did not pay for a set of strippers, how much would it cost to strip the job by hand, time and time again? If you did not use counters how much would it cost to use a matrix over and over again, during the life of the job? Die-cutting tooling is a fundamental requirement of the carton and corrugated box manufacture process. Such tooling is made in 90% of cases by a third party specialist die-making organisation. As such it has a direct cost through normal procurement channels. Like cars, some die makers are manufacturing a ‘higher end’ product which usually costs a little more. Others offer a cheaper alternative. It is not always simple, especially to the untrained eye, to discern the critical differences between alternate tooling specification and standards. Tooling is an investment and if that investment can yield for you a 5% increase in productivity in your die-cutting operation, the real cost of said tooling is Zero. Efficiencies gained with good tooling will easily offset any direct cost incurred and will result in better return-on-investment. That 5% improvement makes the carton producer more competitive in the marketplace. A focus on buying cheap tooling can at best make savings within your procurement department. However it does not improve productivity, quality or expertise. Measuring ‘value’ is much more important than measuring ‘cost’. Carton companies need to get better at measuring return from tooling in a scientific way. The ‘true cost’ of die cutting tooling is not what is written on the invoice. In the most successful cases the invoice value is insignificant when measures against the total benefit.